The MLB offseason is far from over, but there have been enough big moves made to shake up the hierarchy just a little. With today being New Year’s Day, it seems pertinent to take a look at the teams that are poised to chase a championship in 2019. 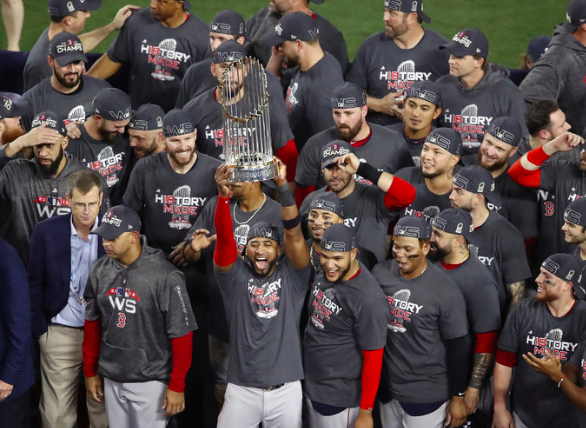 Here is a look at the teams with the best odds of winning the 2019 World Series. The Red Sox still have plenty of work left to do on their bullpen. But the young core of their team will remain intact, so there’s every chance they will continue to be a dynamic offensive force in 2019. Boston has also re-signed Nathan Eovaldi, helping ensure they have one of the top rotations in baseball next season. The Astros will look a little different in 2019 without Dallas Keuchel and Lance McCullers Jr. in their rotation. But they still have a pair of aces in Justin Verlander and Gerrit Cole. Houston also signed Michael Brantley to boost their lineup. More importantly, the Astros still appear to be active in trying to improve their roster. The Yankees moved quickly this offseason to address their rotation, re-signing C.C. Sabathia and J.A. Happ while trading for James Paxton. Whether they make a big-time signing remains to be seen, but the Bronx Bombers are definitely interested in doing everything possible to be championship contenders in 2019. The Dodgers haven’t yet signed Bryce Harper, but things are moving in that direction after their blockbuster trade with the Reds last month. Even if they don’t end up with Harper, the Dodgers have more than enough depth to survive that trade. Of course, they wouldn’t have made that trade if they didn’t expect to make a big addition to help them get over the hump after back-to-back World Series losses. The Cubs haven’t made any big moves this winter, but they’re still hanging around the World Series conversation. At full strength, Chicago has one of the most balanced rosters in baseball. Remember, despite a lot going wrong last season, they were one game short of a division title, so they remain a championship threat. Cleveland has sustained some losses this offseason. However, the moves they’ve made will make it easier to keep their starting rotation intact. Cleveland’s rotation plus the tandem of Jose Ramirez and Francisco Lindor will make them heavy favorites in the AL Central, which means their path to the playoffs will be a little easier than most teams. That alone keeps them among the top favorites to win the World Series in 2019. Despite winning the NL East last year, the Braves still have a long way to go to become a true championship contender. However, they added both Brian McCann and Josh Donaldson early in the offseason, giving an otherwise young lineup a couple of veteran hitters. Of course, their pitching staff could still use some help if they want to repeat as division champs in 2019. The Brewers were awfully close to reaching the World Series last year, but they definitely need to improve their starting rotation to take that next step. Milwaukee’s lineup is in great shape and obviously, their bullpen is one of the best in the business. But the Brewers have yet to do anything significant this winter to establish themselves in what looks like a competitive NL Central. The Cardinals, meanwhile, have been busy. Trading for Paul Goldschmidt should make an immediate impact for St. Louis offensively. Andrew Miller has also been added to a bullpen in need. However, they still look like the third best team in the NL Central on paper, so they still have work to do if they want to be a World Series contender in 2019. The Phillies haven’t quite delivered on their promise to spend “stupid” amounts of money. It also looks less and less likely that they’ll sign either Harper or Manny Machado. However, the Phils have added both Jean Segura and Andrew McCutcheon, so they definitely look better than they did a year ago. But it still may not be enough in what could be a tight NL East. The Nats are going to lose Harper, but that may not stop them from making noise in 2019. They should have enough outfield depth to survive without Harper, even if they lack an impact bat in the middle of the order. It also doesn’t help that Daniel Murphy has moved on as well. But after signing Patrick Corbin, Washington’s top three starters are second-to-none in baseball their rotation could carry them a long way next season.